So…this was an Amiga game? Yep. Quick history lesson for you. Putty Squad – sequel to Silly Putty and SNES remake Super Putty – was originally supposed to be released way back in 1993 and was even sent out to reviewers who scored the game very positively ahead of its release. But then, unexpectedly, the game never hit store shelves. In 1993, the market was unkind to the Amiga. The rise of console gaming was really hitting a stride and many high street retailers were no longer interested in stocking Amiga games. Back then, there were no online retailers like Amazon or Play, and publishers relied solely on retail. As a result, the game never officially released. Now, the developers have decided to give it another go, releasing the game digitally on Playstation 4 at launch. Unfortunately, this one has somehow got lost amongst the shuffle of launch titles and received barely any coverage. We’re checking it out through an As We Play, but have to ask, 20 years later, has the game been worth the wait? And are the people that have waited an eternity for the game even interested in playing it anymore? 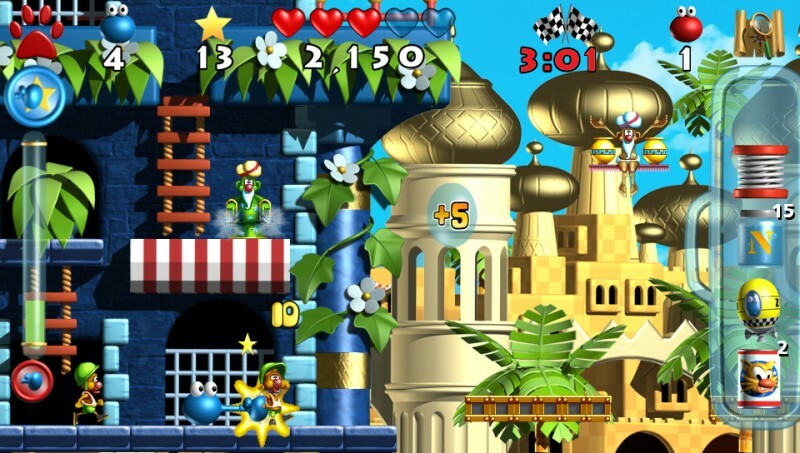 Well, the retro nature of Putty Squad is most definitely still alive in this release. It feels like a classic Amiga title with its quirky title screen, looping music and big floating words. Nobody can complain System 3 have not remained authentic and true to their roots. For now, we’re going to fly through the tutorial to get a feel for the game. The goal of Putty Squad is simple, collect stars to improve your firepower and absorb red putties in order to open the door to the exit, allowing you to move onto the next level. However, the game becomes slightly more technical the deeper in you go and isn’t your traditional platformer. In Putty Squad, you have to stretch between some ledges in order to reach all of your objectives and find the game’s hidden secrets. Holding square turns the blobby putty into stringy putty, making the character more flexible and able to move between areas. Putty can also inflate like a balloon and float up the screen, punch obstacles and absorb nitro bombs to blow up bunkers or other impenetrable areas. Then there’s other power-ups, such as a Pod that lets him sail up the screen, a firing Imp with a rocketlauncher, a decoy, little putty minions that blow up on enemies and tons more. Putty Squad is clearly full of great ideas and puts games like Knack to shame with the amount of creativity powering it, but I feel like the Tutorial is really throwing things at the player, almost too much. It’s a funny thing. Back in 1993 – and even earlier – a Tutorial full of things to do was perfectly fine. That’s how things were. Games were victim to a cookie-cutter formula and the only way to teach a player was to make them sit through 10, 15, sometimes 30 minute tutorials, explaining all the ins and outs. Nowadays however, games tend to introduce things gradually throughout gameplay. The pacing is much better and less static. This already creates a big concern for me. The Tutorial alone really exposes the age of ideas behind the development of Putty Squad and i’m not sure many people are going to get onboard with that. Having gamed since the early days of the Commodore, i’m completely comfortable with this and understand it. I get the history of the game and the arduous development cycle, but I do have to question who the title is really for? In 2014, gamers just want to jump into the action and will avoid a Tutorial at all costs. In this case, doing that will probably confuse them completely. There’s too much they need to know before setting out playing this and I’m not sure many have the patience for that. But does it all work? Yeah, it comes together quite well. Once you understand everything that’s going on, the game offers a nice, moderate challenge and remains relatively refreshing throughout the Marathon mode. There are some immediate frustrations, though. For instance, scrolling through your inventory is a horrendous chore. The ease in which the touchpad is used in games like Killzone makes the sluggish movement in Putty Squad unbearable and unforgivable. The responsiveness definitely needs to be tweaked. I also think the game may have too many ideas. There are a lot of power-ups and if used correctly, basically leave Putty unopposed through most of the game as there’s a counter-balance for every threat encountered. Everything does get a bit too chaotic and I think some slowdown on the ideas would have been more favourable. The map is also a real frustration. If you want to go back and replay a level, you will have to stay the course of the levels and can’t progress ahead again unless you quit out of the map screen. Surely an easy fix, but a noticeable pain in the posterior. Yes, it is. And there are so many nice touches here. Time Attack for replayability. Stickers to keep coming back for, as well as additional challenges. There’s a quirky, memorable cast of enemies and friends which gives the game its own staple and as launch titles go, it’s actually one of the better ones on PS4. This is a perfect title for Remote Play and works fantastic on Vita. Still, it’s glitchy. I’ve experienced a few hard-crashes already and the recording of video footage is pretty erratic. The game is, unfortunately, full of weird, glitchy issues that need to be patched out. Perhaps create a more engaging tutorial. 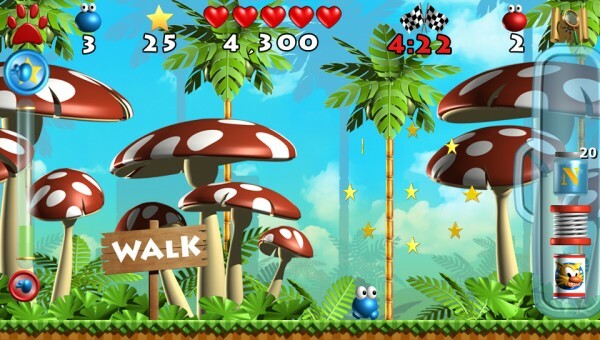 Putty Squad is an entertaining platformer. It’s certainly not the best one we’ve played in 2013, but it’s definitely not the worst. The game is very much stuck in the 90’s and brings back many dated gaming concepts, such as static backgrounds and a frustrating musical score that will definitely grate over time. Aspects that only retro enthusiasts will be able to look past. Was it worth the 20 year wait? Probably not. But if you’re looking for something entertaining to sink your teeth into, are on a moderate budget, or got bored of Knack and can’t deal with LEGO, this is your alternative and it’s a good one. Though, a cheaper price point would definitely be more beneficial. Putty Squad is for those for lived the early 90’s era of gaming and loved it. It’s also for those who don’t mind a chaotic platformer with lots to remember and are comfortable working against the clock. This is one nostalgia trip that had me smiling. If you have any specific questions about the game, noticed any problems or don’t feel we’ve answered something specifically enough, sound off in the comments below and we’ll get right on replying.